A Monroe County, NY jury has found a Rochester, NY man not guilty of assaulting a Rochester Police officer. On April 2, 2012, 25 year old Jose Lugo was talking with friends near his home on Flower Street on Rochester, NY’s east side, when Rochester, NY Police officers, Kevin Flanagan, Joel Hasper and Richard Doran raced up the wrong way of a residential one-way street, pulled up, grabbed him, and brought him over to an RPD cruiser. When Lugo questioned why he was being stopped, the officers immediately threw him to the ground, where they punched, kicked, and tasered him at least three times, including two “drive stuns” which is when a taser is applied directly to the skin. When neighbors on Flower St., including Lugo’s aunt, Annette Velazquez, a Rochester City School district employee, who was visting her elderly parents, pleaded with officers to stop beating Lugo, RPD officers turned on them. When Annette Velazquez told Mitchell that she was going to call Rochester, NY Police Chief James Sheppard, whom she knew personally from having worked with him when Sheppard was the director of security for the Rochester City School district, officer Mitchell confiscated her phone, pepper-sprayed her and placed her under arrest. Velazquez wasn’t the only one pepper-sprayed or arrested. In fact, a pregnant woman and an elderly woman were also pepper-sprayed. Officers also took the pregnant woman’s phone and arrested her as well. In an attempt to cover up their unlawful actions, including not only beating Lugo, but pepper pepper-spraying and arresting innocent people, RPD officers charged Lugo with assaulting officer Richard Doran. Well, the jury of six men and six women did not buy the RPD officers’ story, and announced their not guilty verdict Wednesday morning. After the verdict, I had a chance to speak with juror # 3, a middle aged saleswoman, who asked that I not use use her name, and who had some very interesting things to share with me regarding what the jurors thought of the trial. “The police officers were overzealous, it’s like each officer was like a billboard, saying just because we are police officers we can do what we want,” said the juror. Particularly troubling for the jurors, said juror # 3, was how Rochester Police officers shoved Annette Velazquez, pepper-sprayed and arrested not only her, but other witnesses, including a pregnant woman. “They feel they have the advantage and since they are equipped, they think, the law is going to side with me.” said juror # 3. According to the juror, something which they also found disturbing was Monroe County district attorney Michael Harrigan’s cross examination of defense witness Ana Davila, an elderly woman who witnessed RPD officers Kevin Flanagan, Joel Hasper and Richard Doran stop Lugo and beat him, as she stood in the front of her house. Harrigan drilled Davila on the stand, asking her why did she like to go outside and did she normally go in her front yard, as if there was something wrong with that. During the week and a half trial, Lugo’s attorney, Monroe County Public Defender Sonya Zoghlin, assisted by law graduate Stephanie Poray, put on a strong case for the defense, including pointing out inconsistencies in the officer’s testimonies, and most importantly, the fact that the entire case was based on the unlawful actions of RPD officers Flanagan, Hasper and Doran. On April 2, 2012, Jose Lugo did nothing wrong. He was walking down the street, as any citizen has a right to do. The officers said they stopped him because they said Lugo may have been trespassing by standing near a boarded-up, abandoned house. Under New York State law, trespassing is a violation, not a crime. Furthermore, as in this case, police must first know who owns a property to be sure if in fact an individual is trespassing. In a successful attempt to show the jury that the entire case was based on an unlawful stop and forcible seizure of Jose Lugo’s person, Zoghlin got each officer to admit, on the stand, that they did not know who the owner of the boarded-up property was, proving that the officers could therefore, not have known if Lugo, or anyone else for that matter, was trespassing. Therefore, the officers’ actions of stopping Lugo and grabbing him, were unlawful. Lugo was charged with assaulting RPD officer Richard Doran by punching him in the face. Something the jury did not believe. In fact, it was the other way around, with Lugo being the victim of police brutality. Whether indoctrinated in their academy training, or adopted once they hit the streets, more and more Rochester, NY Police officers are behaving like ‘soldiers’ instead of law enforcement officers. On the stand, each officer’s face lit up when describing their “fighting” and “combat training” they each took at the police academy, along with the many “holds” and “moves” such as “three point landings” and “knee strikes” they use on people. At one point, all three officers admitted to doing several “knee strikes” on an already handcuffed, already on the ground, Jose Lugo. RPD officer Joel Hasper refused to admit that what he calls a “distractionary jab”, is a punch to the face of an innocent young man. 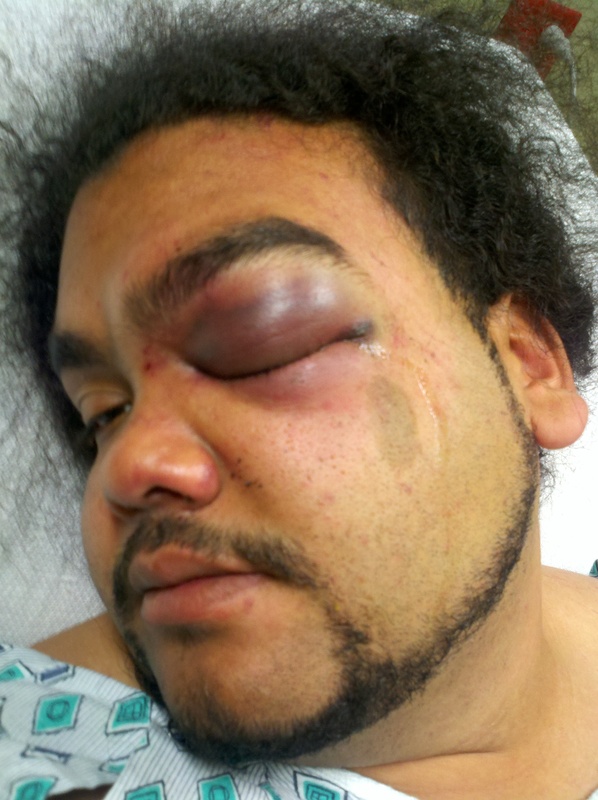 As you can see in the photo above, Jose Lugo suffered badly swollen-shut left eye, as well as multiple bruises and contusions, including prong marks from the taser. Perhaps one of the most disturbing issues here is the Rochester, NY Police department’s well known pattern of creating and escalating unnecessary situations. In fact, not just in Rochester, NY, but throughout the country, the whole ‘to serve and protect’ slogan is being questioned by citizens who call police for assistance. People have realized that many times, calling the police for assistance, is actually calling in another problem. The result is an affirmation, especially in Latino and African-American communities, that the police are not there to serve and protect them, but to do disservice them and abuse them. I asked Ms. Zoghlin if she had any advice for someone, who as Jose Lugo was, may be approached, and grabbed by a police officer. “Don’t resist. Remember the officer’s name. File a complaint,” said Zoghlin. Then, Ms. Zoghlin, added something I feel is so true. “Public Defenders are awesome. We get a bad rap in the community. People should know that we are experienced, dedicated and skilled at our job,” she said.